Add stevia, pumpkin pie spice and vanilla. Add nuts to egg white mixture and mix well. Taste for sweetness. 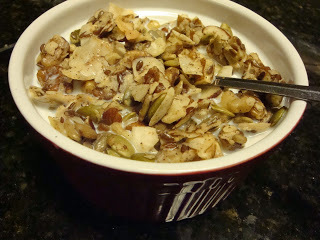 Spread granola over parchment paper. Bake in a preheated oven just below 225 degrees. Cook for 80 minutes, stirring it every 20 minutes (just set a timer). Then you can just turn off oven and leave for 1 hour or longer to continue to dehydrate. Remove and allow it to cool before placing in an air tight container. Nutrition: 1/2 cup has about 5 carbs compared to regular "healthy" granola has at least 30-40 grams and no one ever eats just 1/2 cup. This stuff will fill you up!